In Need of Peoria RV Repair? Turn to the Team at Fix My RV AZ! There are many complicated systems aboard your family’s RV. Your refrigerator has a cooling system that must remain level and balanced, you have two separate electrical systems that are responsible for powering different appliances at different times, and even your awning houses a somewhat complex opening and closing mechanism. 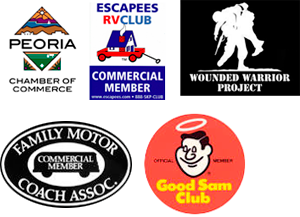 So if you happen to find yourself parked at an unfamiliar campsite in Arizona and in need of Peoria RV repair, who can you turn to? Fix My RV AZ is proudly offering troubleshooting, repair, and maintenance services for those in need of Peoria RV repair in Arizona. We are a fully mobile RV repair service that will come to you. We will respond to your service needs regardless of location- whether you are parked a local campground, a storage lot, or your home driveway. If you find yourself experiencing trouble with any of these appliances or systems, contact the Peoria RV repair professionals at Fix My RV AZ. Our expert staff are on hand and waiting for your call! Visit our website for a list of our mobile service partners throughout Arizona, or to read what real people have said about our services, click here.